More than 74 percent of the people served at the Food Bank purchase inexpensive, unhealthy foods because they cannot afford healthier options, such as produce. To meet this need, the Food Bank holds Produce to People (P2P) distributions. 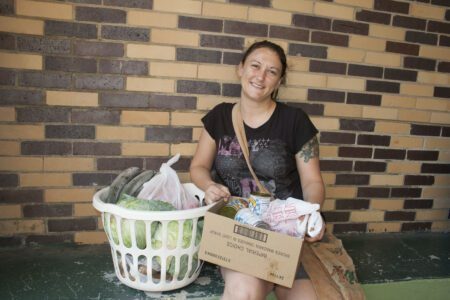 Each month 8,000 households receive 30-50 pounds of produce at 18 distributions throughout southwestern Pennsylvania. Nearly three out of four items distributed are produce. Items include potatoes, carrots, onions, cabbage, sweet potatoes and apples. These large-scale distributions increase nutritious and fresh food access for our neighbors, shortens the time produce remains in our warehouse and connects individuals with important health, housing and employment resources offered by our partner organizations. In Need Of Fresh Produce? We operate Produce to People distributions in eight counties in southwestern Pennsylvania. Please see the list of distribution sites below. You may register at any distribution you choose. Upon arrival, we will require you to answer and sign a quick questionnaire. Then you will receive a ticket, which you will exchange for food. You do not need to bring additional paperwork—the questionnaire is a legal document. Signing it certifies that you qualify for the food. For a full schedule of calendar dates, visit our Produce to People Google Calendar. For current printable Produce to People calendars, click here.